Flames leap from the former Surrey home of Mandrake the Magician. Aug. 29, 2016 6:00 a.m.
A home that burned to the ground in North Surrey on the weekend was once home to a world renowned magician. 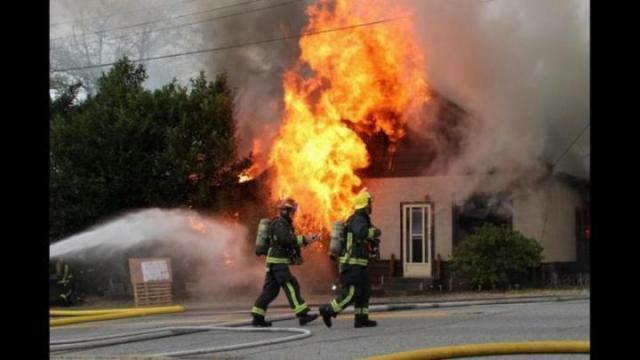 Leon Mandrake (Mandrake the Magician), a famous vaudeville-era entertainer, once lived with his wife and family in a home at Grosvenor Road and Kindersley Drive, a home on the city’s heritage inventory that exploded into flames on Sunday morning. The home was slated for demolition, and several people who were living there were expected to be out in the next few days. Mandrake’s son, Lon, told Black Press Monday it was sad to see the home destroyed. He said many of the interior finishings in the 1936 home were take from the old Port Mann Inn, which had been demolished around the time an old store was built at the site. His father’s uncle originally built a corner store at the site. Mandrake turned it into home, with a magic room in the back, where he worked on his act, often in front of members of the neighbourhood. The family moved out of the home after Mandrake died in 1982. Lon said he still took his mom (Mandrake’s wife Velvet), by the home to reminisce about old times. He especially remembers the Christmases, where the family would entertain and have visiting celebrities who came to B.C. After his dad died, the home experienced a couple of break-ins, and his mom decided to move to a smaller – and safer – apartment. The home was on the City of Surrey’s heritage inventory, but was not given Heritage Protection. As recently as May, the Heritage Advisory Committee vote to review its status.